Harvard scientists have launched the largest-ever research program into “solar geoengineering,” a controversial technique involving the injection of aerosols into the stratosphere with the goal of cooling the planet and reversing climate change. Launched this weekend, Harvard’s Solar Geoengineering Research Program will investigate the safety of geoengineering as well as its environmental and political implications. Scientists specifically look into a technique of injecting specific particles into Earth’s upper atmosphere to create a barrier that reflects more sunlight away from the atmosphere. “This would therefore offset some of the climate impacts from global warming by cooling down the global temperature of the earth,” said Elizabeth T. Burns, a research fellow at SEAS. 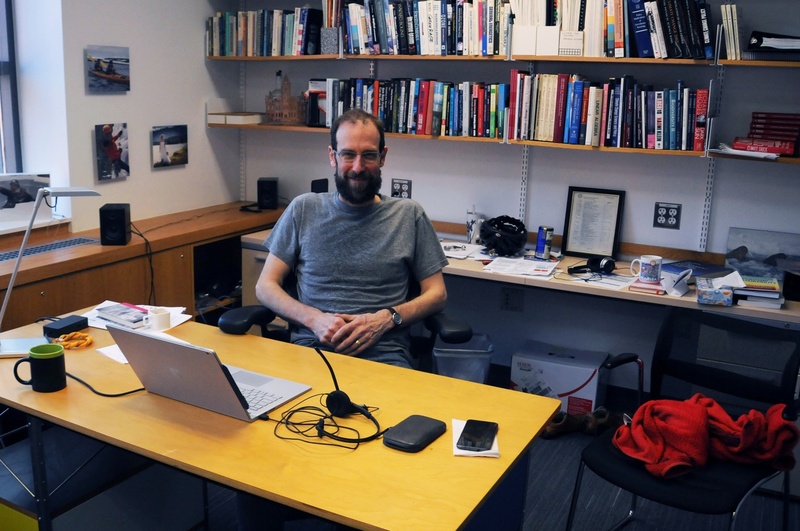 David Keith, a professor of Applied Physics in SEAS, poses for a portrait in his office at 12 Oxford Street. Along with Environmental Sciences and Public Policy lecturer Gernot Wagner ‘02, Keith co-directs Harvard’s Solar Geoengineering Research Program. Its proponents tout solar geoengineering as a climate change mitigation tactic to supplement other remedies, which include reducing carbon dioxide emissions into the atmosphere. But the technology is not without its risks: the sulfate aerosols that would be used produce sulfuric acid, which could dangerously damage the ozone layer. With the program’s launch, Harvard affiliates may now apply for grants and funding to pursue research in the field. Environmental Science and Public Policy lecturer Gernot Wagner '02, who co-directs the project, said the researchers aim to gather evidence showing the benefits of solar geoengineering. Wagner also said he wants solar geoengineering to be taken seriously as an additional strategy to mitigate climate change, which scientists say may pose serious threats to life on Earth. David Keith, an Applied Physics professor who also co-directs the program, said he ultimately hopes to create a blueprint that estimates how the technology could be managed, financed, and governed based on its potential risks and environmental impact. The initiative will be housed under Harvard’s Center for the Environment, and will have an advisory committee with affiliates from the Center for Environment, the School of Engineering and Applied Sciences, and the Kennedy School, according to Burns. Keith added that the program has to date raised $7.3 million, but hopes to eventually grow this sum to $20 million. Non-profit organizations including The William and Flora Hewlett Foundation, the Open Philanthropy Project, and the Alfred P. Sloan Foundation have donated to the project, he said. —Staff writer Akshitha Ramachandran can be reached at akshitha.ramachandran@thecrimson.com. Follow her on Twitter @aramachandran13.